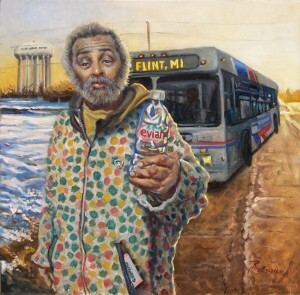 “Overcome” directly addresses the Flint Water Crisis, part of The Quench Project. The Quench Project is heading to Flint, MI for a special exhibition, coming together in response to their unprecedented tragedy. I will be one of several artists who will be contributing work to this important project. 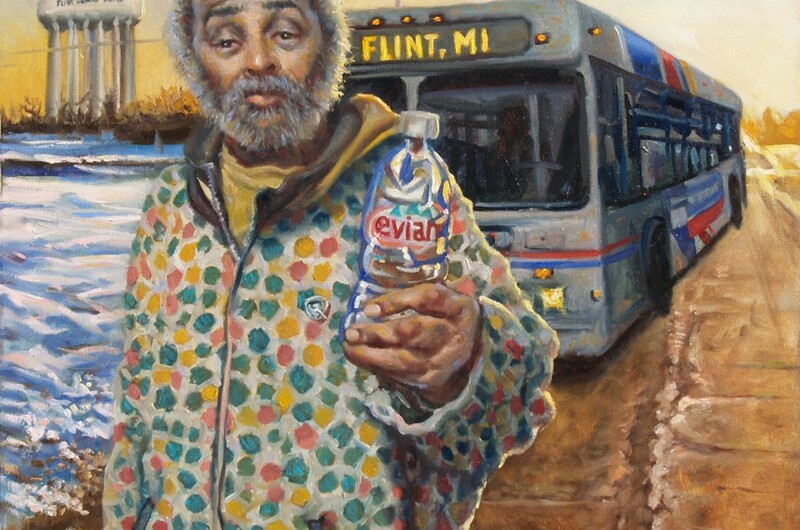 The work will range from political satire to naturalistic depictions, raising awareness of the water issues facing Flint and elsewhere. What is happening in Flint will be happening in other cities across the country unless we take a united stand to do something to prevent it. The response in Flint by the powers that be, have clearly failed. A strong and secure infrastructure is essential to our democracy. It must be made a priority or people will continue to suffer. The Greater Flint Arts Council will be hosting the exhibition during the month of August. Curator Greg Feidler has assembled artists with a connection to Michigan and beyond to bring their unique perspective on the current and future world-wide water crises. Other artists include Melissa Boyd, Mary Nagy and Lulu Cameron. Greg is still hoping to add a couple more artists, so if you feel you have something to contribute, please contact him. Flint has received world-wide attention due to the shear size and scope of the neglect on the part of the governmental bodies charged with maintaining a safe environment for its people. Opening night will feature a “Water Tasting,” with tap water from all over Michigan. I’ll be bringing some Charleston water. This will be a touchstone for organizations supporting those effected by the Flint water crisis, so expect to experience political advocacy in action. Mark your calendars. I wanted to wet your appetite for all things water, in advance. One goal for The Quench Project has been to raise awareness of the global water crisis. The causes include growing populations, shifting climates and wealth inequality, brought about by unrestrained Capitalism. In many ways, Capitalism is arguably the most effective economic system man has ever invented. Although there are many virtues to the system, one would be hard pressed to argue that unregulated, unrestrained Capitalism is in alignment with the teachings of Christ, nor any other major religion. I believe we must create a more just system of Capitalism, rather than simply accepting the current form as a “necessary evil.” We now have the resources and technology to end poverty and suffering; all we lack is the collective will. I realize this may sound naïve or even dangerous to many. But still, I hope we can at least agree that access to fresh water is a human right; after all, no one can survive without it. Yet there has been a dramatic reversal in environmental regulations, which were put in place to protect fresh water supplies and the quality of life for future generations in the U.S. These are battles many of us thought we’d fought and won years ago. Now, the EPA is under attack and climate change is depriving access to many. There are water shutoffs to the poor, who simply cannot afford to pay rising costs, in Detroit, Baltimore and elsewhere in the U.S. Meanwhile, wealthy corporations in those cities, are not being required to pay what they owe. Lake Erie is under threat once again of becoming a dead lake, after its amazing comeback during the 1990s. In 2014, Flint’s city council decided pumping lead-tainted water from the Flint River was a good idea, destroying the futures of innocent children. We are now dealing with the devastating effects of unregulated fracking and industrial farming. Economic imbalance is causing needless suffering while big oil and coal lobbyists are unfairly skewing the conversation our politicians should be having with the citizens they’ve sworn to protect and defend. Those who study such things agree that wars in years to come will most likely be fought over access to fresh water, rather than oil. As climate change causes shifts in the environment, and populations continue to spiral out of control, water will become even more of a political issue. And yet, wealthy citizens in California, where they are experiencing near drought conditions, are demanding to be exempted from water conservation laws. Water bottlers and utility companies continue, unencumbered, to treat fresh water as a commodity, while the most vulnerable among us are being deprived access. Surely, access to fresh water must be protected as a right, not a luxury. In more and more places around the world, people must walk miles each day to get fresh water. Shifting climates, apathetic leaders and privatization are insuring that we will soon reach a breaking point. Small scale wars are already being fought in some places over the corporate takeover of water. In Bolivia, in 2000, there was large scale unrest – known as the Cochamba protest – in which 10,000 or more protesters fought over rising water rates. Is it possible we are deluding ourselves when we assert that water issues are someone else’s problem? I believe the more we treat our water resources as a profit-center, the closer we are getting to a future consumed by conflict and suffering. Keep in mind, the water we are drinking today is billions of years old; it has been recycled millions of times over. In recent decades, however, trace elements of drugs and other impurities, have now become a permanent, molecular component of the water on this planet. The same water responsible for bringing life into being is being permanently changed as a result of human activity. We need to do something about how we are transforming the Earth, over which God gave us dominion. This “dominion” over other beings and our environment came with a responsibility to maintain these finite resources; our role as caretakers of this planet is an extension of our worship and mission as followers of Christ. We have moved passed the half way point with only 13 days to go! Sue Dunham Filbin liked this on Facebook. Luciano Oliveira liked this on Facebook. Melaney Mills liked this on Facebook. Dianne Peters Pegg liked this on Facebook. Holliday Taylor Martindale liked this on Facebook. I will make my cartoons available as well as any other art. Please lmk how to connect. I sent Greg your info. He’s looking for a couple more artists. Showey Howey liked this on Facebook. Paul Horton liked this on Facebook. Patty McBride liked this on Facebook. I believe artistic expression is vital to every healing process! You’re heartfully bringing love, beauty, and an opportunity to heal to this community! Fantastic! Great work, Robbie! Deanna Zapico liked this on Facebook. Denise Nowak liked this on Facebook. Joe Ales liked this on Facebook. Kimberly Hewston liked this on Facebook.